Did you know that 2012 is the 100th Anniversary of the Girl Scouts? My daughter, Hannah is excited to join the Girl Scout organization as a Daisy this fall and it will be perfect timing for this special anniversary. Adora offers a wide selection of special edition dolls and is proud to be the only doll company that has the license to make Girl Scout dolls! There is a Daisy, Brownie or Girl Scout for every little girl with five ethnicities available. 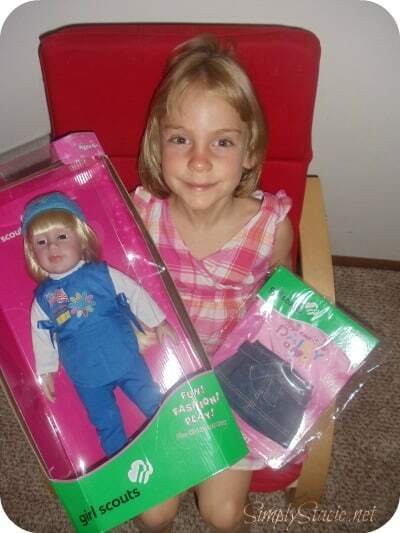 Hannah was so excited to play with her “Chloe” 18” Girl Scout-Daisy doll that arrived in costume including the traditional blue tunic, beanie hat, matching pants, white shirt and sporty shoes. I love the attention to detail with the daisy flower petals, American flag, troop numbers and patches and pins that her “Mommy” ironed on just like I will proudly do for Hannah. “Chloe’s” eyes open and close and she has eyelashes and blond hair. She has a cloth body with a chest plate and durable vinyl with moveable joints at her neck, shoulders and legs so Hannah has lots of fun posing her in different positions while playing with her new friend. Adora dolls are very life-like and are made to be the perfect doll for playing. My daughter has only recently enjoyed playing with her dolls and it is so much fun to sit back and listen to her role playing and interacting with her babies and “friends”. 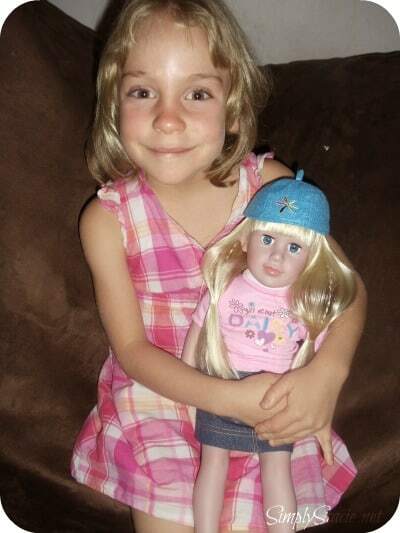 I am very impressed with the quality and affordability of her Adora dolls and at only $69.95 I find “Chloe” to be a real treasure that is sure to be a part of my daughter’s “family” for a long time. There are also lots of fashionable accessories for her Girl Scout doll too such as the Girl Scouts Fashion Outfits which retail for only $19.95 for each set. Do you have a special Girl Scout in your life that would love to receive her very own Daisy, Brownie or Girl Scout doll from Adora? You can choose from Chloe, Abigail, Ava, Madison and Lily. You are invited to visit Adora to browse the entire collection of Adora Girl Scout dolls and accessories and purchase your favorite. the LUCKY LEOPARD doll is really cute! I like the Winter Wonderland doll..so sweet! The Penny Brite Tinkerbell would be a hit for sure! My daughter would love ZEBRA ROSE. I would love the adorable Kewpie Panda Perfect! My daughter would love the Chloe or Abigail doll. Kewpie Owlsome but to be honest…any of them! Its too hard just choosing one because they are all so adorable! I remember when my daughter was a Girl Scout. This would be such a wonderful keepsake of their special anniversary. I like The Love Bug Doll! I would love the Ring around the posie doll. I like the Madison Brownie doll! My girl would love the Giddy Up Girl! I think butterfly boo is cute. Thanks for the chance. The Here Kitty doll looks very nice!